Biodiversity describes the variety of life on earth. This variety is usually understood in terms of the diversity of plant and animal species, but it also refers to differences at all other levels of the natural world, including genetics, habitats and ecosystems. Human activity is causing the loss of global biodiversity at an ever-increasing rate. Species need to be protected from extinction as they are valuable in their own right. We also depend on huge number of plants and animals for our survival as they provide us with resources such as food, shelter and medicine. Additionally, a healthy environment helps protect us from the effects of climate change. At a local scale, parks and open spaces that are rich in wildlife are more enjoyable places to visit. One of the ways in which the UK has responded to the need to conserve biodiversity is through the creation and implementation of a Biodiversity Action Plan (BAP). A Biodiversity Partnership was set-up in 2001 with the original intention of producing action plans for the borough’s wildlife. However since the London Biodiversity Partnership were already producing action plans for many of the species and habitats we were concerned with, we decided to prioritise contributing to meeting their targets. Actions include those for protecting grey herons, peregrine falcons, house sparrows and conserving acid grassland. The team advises Wandsworth Council on its responsibilities with respect to wildlife legislation; advises on best practice in ecological maintenance of parks. Phone 020 3959 0060 or email us. Many of our parks and open spaces are protected because of their importance for wildlife. Download our designated wildlife sites. Urban parks can act as important wildlife sanctuaries and provide a place where people can engage with nature. If managed correctly, an open space can cater for the needs of biodiversity as well as the public. Many of our parks and public gardens have been designated as Sites of Importance for Nature Conservation (SINCs) and some have statutory designations, such as Local Nature Reserves. Your own garden might be the best place to see wildlife in the borough. Just over 20 percent of Wandsworth is covered by private gardens. Gardens provide pockets of valuable green space which help maintain biodiversity, especially in urban settings. The fact that each gardener has their own personal preference means that every garden is different and creates a mosaic of habitat, which is key to wildlife interest. Rarer species such as stag beetles and bats. Churchyards and cemeteries have many features which attract wildlife. They are often home to some of our oldest trees, which provide nesting and roosting opportunities for birds and bats. In autumn, it is also common for fungus to rapidly spread up these trees from the tip of their roots. Trees in cemeteries are also good for mistletoe, a rare plant in London. (See the Species section for information). Another familiar sight is an abundance of lichens on the lime-rich headstones. Many animals that struggle to survive on intensively managed farmland can find a refuge on your allotment. It is possible to create suitable habitats for allotment-friendly wildlife whilst continuing to grow fruit and vegetables. For information on encouraging wildlife to your allotment, download a copy of Natural England’s wildlife on allotments booklet. There are 18 species of bat in the UK, six of which have been recorded in Wandsworth (45 & 55 Pipistrelle, Noctule, Daubentons and Leislers). You are most likely to see bats over lakes in parks, and along rivers, hedgerows and railway lines as they provide excellent foraging habitats for bats. Bats have suffered serious decline during the past century, mainly due to loss of roosting sites and a decline in insect numbers and diversity. Home renovations such as filling cavity walls, converting lofts and treating timber with chemicals have also had negative impacts on bats. They are fully protected by UK and European law due to their population status, which means it is illegal to injure or kill a bat, or block or destroy a roost. A robin-sized bird of the thrush family with a distinctive orange-brown tail. London is home to around 30% of the national breeding population, which itself is less than 100 pairs. Black redstarts can be found on industrial sites along the River Thames and Wandsworth is known to have breeding pairs. The birds favour stony bare ground, sparsely vegetated areas and structures such as cranes, old jetties, piles of scrap metal, or disused building complexes. As these are often found on brownfield land, the birds are particularly vulnerable to redevelopment projects. Linnets are another London Biodiversity Action Plan (BAP) bird associated with brownfield sites that have been recorded in Wandsworth. The buttoned snout moth is small and brown and at first glance not very interesting. However, it is a nationally scarce moth and as such has its own Biodiversity Action Plan (BAP). Its larvae feed on hop plants during the night. It is particularly keen on hops growing along the ground rather than up a fence or wall, which are common on brownfield sites or railway line embankments. In east Wandsworth, Buttoned snout moths have been recorded alongside tube lines. The tube lines not only provide the right habitat but also allow for colonies of moth to travel and mix, which ensures diverse genetics and a better chance of survival. Grey herons are the top of the food chain in freshwater habitats, feeding mainly on fish, but also frogs, voles and ducklings as the opportunity arises. As a top predator, their presence in an area can indicate a healthy freshwater environment. Wandsworth leads the successful London Biodiversity Action Plan (BAP) for grey herons. The third largest heronry in London is on Battersea Park Lake. Approximately 30 nests are built on the islands each spring, which are used by around 90 herons. 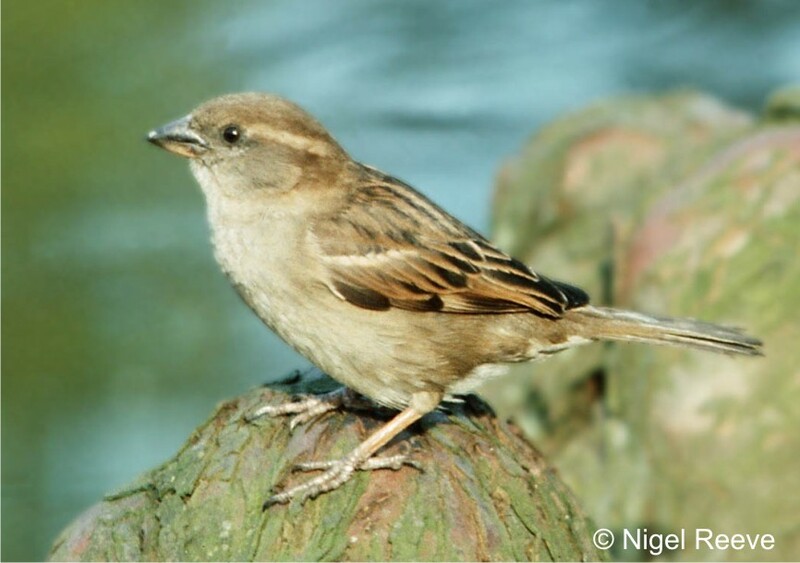 Until about twenty years ago, the house sparrow was a familiar sight in London. Their numbers have since fallen dramatically, for reasons that are not fully understood. A combination of factors have been blamed for their decline including changes in car exhausts fumes and the loss of habitat through paving over front gardens. However, we still have several colonies of sparrows in Wandsworth, in areas with large back gardens and open spaces. Mistletoe is a parasitic plant which grows in the branches of deciduous trees. A lot has been pruned out of trees over time due to fears about the damage it may cause to the host plant. This has caused a decline across Europe, which has been made worse by people collecting mistletoe without permission. We only have a handful of locations where mistletoe grows in Wandsworth and so we are keen to find out if you have it in your garden. Please contact us if you do. Pennyroyal is a low growing, scrambling plant belonging to the mint family. The erect, flowering stems appear from July to late autumn and produce dense whorls of lilac flowers with a strong and pungent smell. It prefers damp conditions where there is trampling and disturbance. It has been found in areas adjacent to the River Wandle. Pennyroyal has suffered a catastrophic decline throughout the UK and is now classified as Vulnerable by the World Conservation Union (IUCN). It is specially protected under Schedule 8 of the Wildlife and Countryside Act 1981 and listed as a priority species in the UK Biodiversity Action Plan (BAP). This bird of prey is now colonising London as part of its national recovery. There are now around 2000 pairs in the UK. Largely a cliff-nesting species, peregrines readily take to nesting on large buildings in cities. Battersea Power Station is home to a breeding pair who have raised young every year since 2000. The inner Thames marshes are an important feeding area for visiting peregrines in winter. 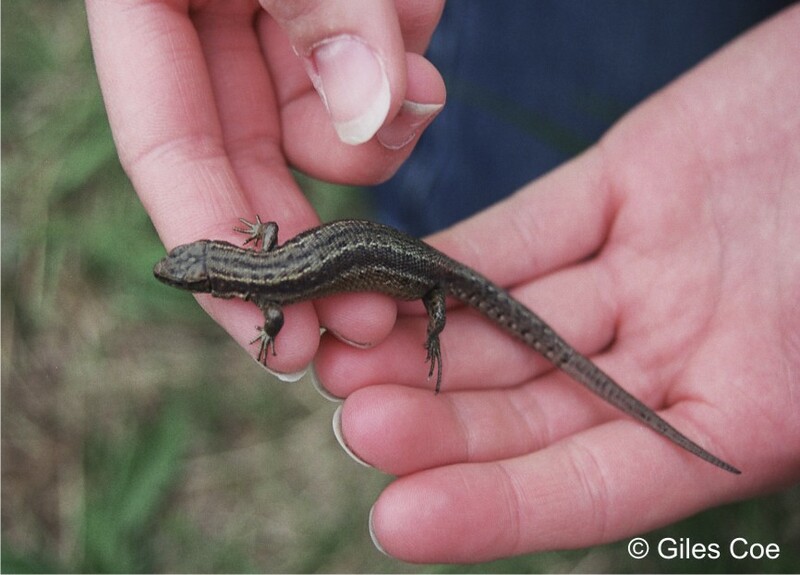 Four of the six British reptiles have been recorded in Wandsworth: the common lizard, slow worm, adder and grass snake. They all live on heathland, but the slow worm is most likely to also be found in gardens with a suitable habitat. Reptiles are threatened by persecution and a lack of understanding and as such all species are fully protected by law. A significant number of Britain’s stag beetles are found in Wandsworth, although numbers are declining nationally. Growing up to 5cm long, it is Britain’s largest beetle. With its prominent antler-like jaws, the stag beetle is a memorable sight. The females lay their eggs in dead wood, which the fat finger-sized larvae spend up to five years feeding on. Adults emerge between May and August, flying in an ungainly fashion in search of a mate. Gardens appear to be the most important habitat for the stag beetle in London so you and your garden are probably crucial to the conservation of the stag beetle. Leaving old wood to decay naturally in your garden will provide them with a home and a future. Look for them flying on the commons and in gardens. Water voles are secretive creatures who create their homes in the banks along rivers, ponds and canals. They have a vegetarian diet, consisting mainly of grasses and bank vegetation. Water voles were almost made extinct in the 1990s due to habitat loss and predation by introduced species such as the North American mink. They are currently extinct in Wandsworth, but we have acquired funding to enhance the river bank habitat in King Georges Park as part of a wider project to reinstate them on the River Wandle. Wildlife crimes involve any type of animal cruelty or the buying, selling, disturbing and harming of wild plants and animals which are protected by law. Taking the eggs, skins or feathers of protected animals and removing protected plants. The crimes reduce the size of particular specie populations, threatening rare plant and animal species by pushing them closer to extinction. Wildlife crimes cause undeserved pain and suffering to animals while often being linked to other serious and large-scale crimes. Wandsworth has some very dedicated and passionate people who spend their time gathering information about the wildlife in our parks, commons and open spaces. Peter White has been walking Wandsworth Common since around 1990, recording the birds he sees and hears on an almost daily basis. In 2003 he started doing the same on Tooting Common. Peter writes up a monthly summary of these bird records for each common and gives hints (based on his experience) of which birds you will see in the months to come. Peter very kindly leads free guided walks around both commons to share his knowledge. They all start at 8.30 am (except in Feb. when they start at 9am). If you want to join Peter please wear stout sensible shoes and clothing suitable for the time of year. If you’ve got binoculars please bring them but in order that all those attending can get the best opportunity to view and hear the birds we ask that very young children and dogs are left at home.Free guided walks led by Peter White, bird recorder for the Commons. Discover more about the 100+ species of birds that visit and use our Commons; learn to identify them by sight and sound, and find out about their natural history and behaviour. Download the reports for Wandsworth Common and Tooting Common. Peter also leads free guided walks on the commons. One of the biggest threats to biodiversity comes from development and land use pressure. Consequently, the planning system has a vital role to play in the conservation and enhancement of biodiversity. If you are planning some home improvement or any other kind of building work, there are laws designed to protect wildlife that you need to be aware of. Even if your building work does not require planning permission, wildlife legislation may still apply. Bats and their roosts are fully protected under UK and European law. It is illegal to disturb, kill or injure a bat, or to damage, destroy or obstruct access to a roost. You can find more information from the Bat Conservation Trust and in the Focus on Bats and Living with Bats booklets. Birds are fully protected under UK law. It is illegal to take, kill or injure any wild bird or to take, damage or destroy any nest or egg. You can find more information on the Royal Society for the Protection of Birds. If you know a protected species is using your property, you should get advice from Natural England before making a planning application that might affect it. Similarly, if you discover a protected species during building works, you must contact Natural England for their advice before you continue. Read a summary of these laws. One key factor affecting these species’ survival is the lack of suitable sites where they can nest, roost, hibernate and rear their young. New building techniques often fail to take their needs into account; likewise, home improvement work can block what was once a suitable home: for example, an extension may remove hanging tiles which were used as a hibernating place for bats. There are also types of building work that do not require planning permission, but where wildlife legislation still applies: for example, treating timber. Certain chemicals can kill bats or birds when used in a confined space such as a loft, but there are a number of safer alternatives. If you are planning renovation work, there are many features you can incorporate into the design to help attract wildlife to your property. Green roofs, swift bricks and bat boxes are just a few of the ways you can help conserve biodiversity in your own back yard. London is thought of by many as a concrete jungle. We’d like to challenge that view. Urban areas are becoming increasingly important as refuges for wildlife and you will find a variety of animals and plants if you know where to look. We are fortunate to be one of the ‘greenest’ London boroughs, with parks, open spaces and private gardens covering 40 percent of Wandsworth. There have so far been a total of 1,600 different species recorded within 27 different habitat types. Several rare and endangered species can be found in Wandsworth, including peregrine falcons, black redstarts and stag beetles. Offer advice and co-ordinate actions that can help wildlife locally. Biodiversity officers protect, manage and enhance the local environment and promote awareness and understanding amongst the general public. Our biodiversity team works with Wandsworth Council’s planning department to advise on wildlife issues associated with planning applications. Contact our biodiversity team or call 020 3959 0060. A local Biodiversity Partnership was set up in 2001 with a plan to produce action plans for the borough’s wildlife. However, since the London Biodiversity Partnership were already producing action plans for many of the species and habitats we were concerned with, we decided to prioritise contributing to meeting their targets. Actions include those for protecting grey herons, peregrine falcons, house sparrows and conserving acid grassland. The key to a successful wildlife-friendly garden is allowing space for nature. For example, slightly un-kept gardens provide a variety of habitats, places to shelter and sources of nectar. This will encourage wildlife such as insects, birds, amphibians and bats. Leave areas of grass uncut and undisturbed. Choose a selection of plants which provide a variety of nectar, pollen and berries throughout the year. Provide nest boxes and seed/nut feeders for birds. Provide homes for mammals, such as hedgehog and bat boxes. Provide water for wildlife. Their need to drink and wash often gets overlooked! Create a log pile in a corner to provide shelter for amphibians and reptiles, as well as a food source for insects. Taking some of these steps will help you play an important role in the survival of some of our more endangered species. Neuter your cat at an early age to avoid unwanted litters, which often add to the feral population. Our lakes are home to many different species of wildfowl, including swans, coots and ducks. Each year a number of birds and their young are killed or badly injured by dogs who have been allowed to swim in lakes and ponds.Dogs are welcome in Wandsworth’s parks and commons but are required by law to be kept under control. It is an offence to allow your dog to injure, annoy or disturb any animal, including wildfowl. If you do, you may be prosecuted under the Wildlife and Countryside Act.We place signs around the lakes during the breeding season to advise the public that dogs should be kept out of the water and away from wildfowl on the lake edges. We want to make sure that all wildlife in our open spaces can flourish for everyone’s enjoyment. Green, brown, eco or living roof are all terms to describe a type of roof which is made up of vegetation.There are many different types of green roofs including intensive roofs, which can grow trees and shrubs, and brown roofs, which recreate brownfield-type habitats. Intensive roofs are usually used for recreational purposes whereas brown roofs are particularly beneficial to wildlife.Their use on new developments and retrofits has increased in recent years, as their environmental, economic and social benefits have become more widely understood. However, they can be just as beneficial on a smaller scale, on top of garages, extensions or garden sheds.Find out more about installing a green roof by visiting the Living Roofs website. The more we know about the distribution of animals, plants and habitats, the more we can do to help protect them. However, we are not able to survey all our sites every year so your recordings of wildlife sightings are extremely valuable to us. Please email us with details of your sightings. Whether they’re common or uncommon – they all contribute to our knowledge of biodiversity. Or, you can send your records to GiGL (Greenspace Information for Greater London) www.gigl.org.uk. They are a biodiversity records centre who collate, manage and publish information on London’s wildlife and open spaces. Spending time in parks can benefit your health and wellbeing. There are many ways to enjoy the wildlife of Wandsworth’s parks, from taking a gentle stroll to doing a vigorous early morning run or simply just spending a few hours relaxing in the sun. Global studies have proven that visiting a park increases natural immunity whilst lowering blood pressure, pulse rates and Cortisol concentrations in the body – simply by spending time amongst plants and wildlife. Grass, for example, is a plant found in almost all green places which contains chemicals shown to improve mental wellbeing. Fungi is the name given to a strange group of living things including mushrooms, toadstools, moulds and thousands of other weird and wonderful things. It’s safe to say that if you see something strange growing outside, and you’re not sure what it is, it’s probably a fungus. Unlike plants, Fungi cannot produce their own food. Instead they absorb nutrients from their surroundings. Fungi spend the majority of the year below ground as a mass of thread-like hyphae. October is prime time for spotting mushrooms and toadstools in damp, wooded places. This is because the earth has warmed up and the weather itself usually warm and damp. This encourages fungi to send their fruiting bodies (equivalent of seed pods) above ground as mushrooms or toadstools. They disappear again once the frosts and cold persist into winter. Fungi in the British Isles are fast disappearing because of loss of habitat, changing rural practices, intensive land management and over-picking. Yet scientists are now beginning to understand that many of the fungus species in our woodlands play an essential role in the welfare of trees; others are immensely important in dealing with dead materials turning them back into nutrients ready for plants to absorb. Due to their value to our ecosystems and the difficulties in accurate identification, we ask you to not pick mushrooms in our parks, commons and open spaces. If you have a photo of fungi from a park, common or open space in Wandsworth that you’d like to share with us please email us. This a fast growing, highly invasive plant, which forms dense clumps up to three metres in height. It has large, oval green leaves and a stem that is hollow and similar to bamboo. See photographs of Japanese Knotweed (thanks to Devon Council). It can grow by as much as 2cms per day so it is very difficult to eradicate. The extensive underground root (rhizome) network can extend several metres around and beneath the vegetation above ground. A fragment of root as small as 0.8 grams can grow to form a new plant. Japanese Knotweed is listed in Schedule 9 of the Wildlife and Countryside Act 1981 (as amended) – the purpose of this is to prevent the release into the wild of certain plants and animals which may cause ecological, environmental or socio-economic harm. An infringement under the Wildlife and Countryside Act 1981 (as amended) can result in prosecution. Ensure you have correctly identified Japanese Knotweed – compare your plant to these photographs before you get it treated. Japanese knotweed needs to be treated with “Glyphosate” which is available as a weed killer in most DIY and garden centres. Check the packaging as many items have a brand name (such as “Roundup” ) but Glyphosate will be listed as the active ingredient. Follow the manufacturers’ instructions to apply. You may need up to 3 applications a year for a few years but it will go eventually. It may be more effective to apply the chemical towards late summer/autumn so that the chemical can be drawn down into the plants as it dies off naturally each year. It is recommended that you ensure that any contractor you choose to use holds a Certificate of Competence to use herbicides. Also, ensure that you have included relevant specifications in any contract documents to prevent spread. Expect a contractor to use the “stem injection” technique – as this is a more effective way of administering the chemical than the more normal spraying. It is not recommended to remove Japanese knotweed manually as there is a strong possibility that the problem will be made much worse. The plant can regrow from incredibly small fragments of root, leaf or stem. There is the issue of the disposal of any manually removed plant waste. The Environmental Protection Act 1990 classes Japanese Knotweed as ‘controlled waste’ and as such must be disposed of safely at a licensed landfill site according to the Environmental Protection Act (Duty of Care) Regulations 1991. Soil containing rhizome material can be regarded as contaminated and, if taken off a site, must be disposed of at a suitably licensed landfill site and buried to a depth of at least 5m. An infringement under the Environmental Protection Act can result in enforcement action being taken by the Environment Agency which can result in an unlimited fine. An individual can also be held liable for costs incurred from the spread of Knotweed into adjacent properties and for the disposal of infested soil off site during development which later leads to the spread of Knotweed onto another site. Get further information, including on disposal. If you find an injured animal in the borough, contact: RSPCA 0300 1234 999. If you find an abandoned animal, it is recommended that you leave it alone. Parent birds and mammals often leave their young for short periods of time (sometimes in the most unusual places) to look for food. You should only intervene if the baby is in real danger (on a busy path for example) and it should be placed nearby where the parent can find it again.If you pick up and handle a young mammal, it will almost certainly be rejected by its mother as it will carry human scent. This does not apply to birds as UK species have a poor sense of smell. Young animals taken from the wild by well-meaning members of the public face a much lower chance of survival, and it puts added pressure on animal rescue centres who have to hand-rear them. Attract rats and other vermin. Learn more on how to keep our ducks healthy on the Canal River Trust website. Plant the Scaredy Cat plant (Coleus canina); it can also deter cats and dogs. Find out more about the local authority pest control service, including foxes. Being run over on the road. Use a “beer-trap” (a pot of stale beer sunk in the ground) instead of slug pellets. It is an equally effective way of killing slugs. Or, put the slug pellets inside pieces of pipe or under stone slabs where hedgehogs can’t get at them. As an extra precaution, all dead slugs should be regularly removed. Large, bright green noisy birds seen regularly flying across the borough are Ring-necked (or Rose-cheeked) parakeets. These colourful birds are either loved or hated as garden visitors, primarily due to their noisy demeanour. There are concerns of how they may affect our native wildlife, for example competing with woodpeckers for nest holes. They also have an impact on fruit-growers where they are fond of devouring the tasty buds, which we would prefer they left to become fruits. The first documented breeding of Ring-necked Parakeets in Britain was in 1855 in Norfolk. Small populations were intermittently present in the Greater London area for the next century and the first documented breeding of the twentieth century occurred in Gravesend, Kent in 1969. They appeared more widely in the 1970s but their origins are the subject of a number of urban myths: some say they escaped from a quarantine holding at Heathrow; some say they escaped from an exotic film set in the Shepperton Studios.In their native Asia they eat wide variety of fruit, berries, nuts, seeds, grain, but in Britain they are omnivorous, taking any kind of scraps available. Ring-necked parakeets are hole-nesters, often taking over an old woodpecker nest hole, or a larger sized nestbox. Adult crows are protective of their young. During spring, the first fledglings leave the nest and spend a lot of time on the ground while they learn to fly. The parents watch over them from the trees and will fly at anything or anyone who comes too close to them. During the breeding season, it is advisable to keep your distance from any young bird you see on the ground.